Home » NEWS » What is the Difference Between Deferred Adjudication and Straight Probation? 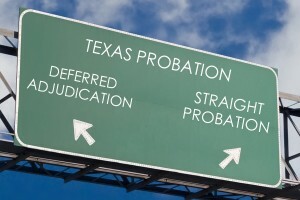 Probation in Texas: Make Sure You are Headed Down the Right Path. What is Deferred Adjudication? When we are counseling new clients, we routinely address the punishment range that is available for the charged offense and whether probation is an option in their case. It is important to note that all criminal offenses (except class C citations) are punishable by incarceration. However, first-time offenders and those charged with misdemeanors and non-aggravated felonies will often receive probation when prosecutors, judges, and juries agree that community supervision (probation) is a better alternative to jail time in the given situation. For some offenses, however, probation is not an option (see our previous article on 3g offenses in Texas). If revoked on a straight probation, the penalty range is limited to the underlying jail term (see more below). Under a Deferred Adjudication, If revoked, the judge may sentence anywhere in the full punishment range for the offense. In Texas, there are two types of community supervision in criminal cases: regular community supervision (or what is typically referred to as “straight probation”) and deferred adjudication (or “deferred probation.”) The difference between them is significant. Chapter 42.12 of the Texas Code of Criminal Procedure covers with both types of probation in Texas. 180 days in jail probated for 12 months. If you agree to this offer and decide to take it, at the time of the plea the judge would ask for your plea of guilty, find you guilty and assess punishment at 180 days in jail. However, he would not require you to actually serve the jail time. Rather, he would probate the jail time and place you on community supervision for a period of 12 months. If you successfully complete the straight probation by reporting as directed and abiding by the terms and conditions, you would not be required to serve jail time for the conviction. With straight probation, the most significant consequence is the conviction itself. When you plead guilty, the judge finds you guilty and a conviction is rendered. You avoid jail time by the sentence being probated, but the conviction remains on your record. A conviction, even if probation, can never be expunged from your record (regardless of the passage of time), so it is important to be wise with your decision to take a plea agreement in which straight probation is offered. If you agree to this offer, you would plead guilty at the time of the plea. However, the judge would withhold finding you guilty and instead place you on probation for a period of 18 months. The reporting and terms and conditions would mirror those of a straight probation. If you successfully complete the probation and are discharged, you would not be required to serve jail time and you would not receive a criminal conviction. With deferred adjudication, the most significant benefit is the case is dismissed upon discharge and no conviction rendered. You not only avoid jail time, but a conviction as well. You also may be eligible to file for a non-disclosure after discharge in most cases. Section 411.081 of the Texas Government Code is the law covering when and if you can file for a non-disclosure after discharge from deferred adjudication. As with straight probation, if you receive deferred adjudication and fail to comply with the terms and conditions, the state can seek to have your probation revoked. However, there are some significant distinctions at a revocation hearing or sentencing on a deferred adjudication case. First, the judge’s sentencing ability is unlimited. This means he can use the entire penalty range. In our example, if you receive deferred adjudication for 18 months for a class A misdemeanor and are later revoked, the judge can sentence you anywhere in the penalty range of 0- 365 days. Also and more importantly, if revoked, the judge will find you guilty resulting in a conviction. This was a rough overview of the different types of probation in Texas on criminal cases. Of course, there are always factors that can effect if and which type of probation is available as an option to you. The attorneys at Barnett Howard & Williams PLLC would be glad to discuss your situation and provide more information about these options. Please feel free to give us a call at (817) 993-9249.